A hundred or more community members marched Monday on Minneapolis City Hall and Chase Bank to demand fair negotiations for Sergio Ceballos and Jaymie Kelly, two south Minneapolis neighbors fighting their JPMorgan Chase foreclosures with the help of Occupy Homes MN. Later in the day, the group reassembled in front of Jaymie Kelly’s home for a short rally, then marched to Sergio Ceballos’s home for a barbecue. Even though “dual tracking” — negotiating with a homeowner while at the same time moving to foreclose on them — is now illegal, Chase Bank sent 30 deputy sheriffs to the the Ceballos family home to evict them on July 24, arresting two people for nonviolent resistance. Supporters quickly removed the foreclosure boards nailed over windows and doors, and three weeks later, the family still holds the home. But Chase refuses to negotiate with Ceballos or his neighbor Jaymie Kelly. Kelly has lived in her home for 30 years she and her husband bought it in 1983 for $74,500. She estimates she has paid for paid for it five times over. She claims she was tricked into a predatory loan after her husband died, and now Chase refuses to negotiate with her. She is awaiting a judgment from eviction court, and if the judge rules against her she could face eviction as soon as next week. Chase claims that Kelly owes $255,000, a statement she disputes. Chase paid $81,000 to redeem the house at the foreclosure sale. Kelly has lived in the same block all her life. Ceballos has lived with his children — Jonathan, Kaily and Jordan Ceballos — in their home for about 12 years. He has repeatedly contacted Chase bank pleading for a mortgage modification but so far it has been unwilling to work with the family. The 20 ft tripod erected on the Ceballos front lawn had been used earlier in the day to block traffic in downtown Minneapolis. City Council Candidate Ty Moore recounted the action of Richmond, California. The current Green Party mayor of Richmond has informed the banks that if they do not rewrite loans on 626 “under water” mortgages to reflect fair market value, the City will exercise its right of Eminent Domain, claim the homes, and resell them to the owners for fair market value. So far this is the only city in the nation to act in this manner. The banks are threatening to “red-line” the city, refusing to lend for any new mortgages and to complicate other city actions. There have been discussions in Minneapolis about initializing a similar plan, but no action so far. 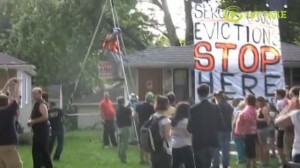 Residents of the Powderhorn and Central neighborhoods in Minneapolis have declared their neighborhood an “Eviction Free Zone” and have pledged to defend their neighbors from unjust evictions. They are calling for an immediate moratorium on foreclosures and evictions until policies are in place to ensure stable, affordable, quality housing for all. Occupy Homes MN led a march to the Minneapolis U.S. Attorney’s office and the offices of JPMorgan Chase to demand a settlement that keeps people in their homes instead of just providing “blood money” by way of paltry settlement checks to people who wrongly lost their homes.